We are so excited about these Solderable Accents! They are available in copper, brass, and sterling silver so you can mix and match your metals and shapes. The whole office has been buzzing with the arrival of these beauties. There are just so many possibilities! Everybody loves the versatility (and price) of copper blanks, but no one likes when the solder sometimes leaves a silver ring around the edge. We've got a solution! For the first time ever, we are carrying copper solder! The metals will match, leaving your pieces clean and pretty. 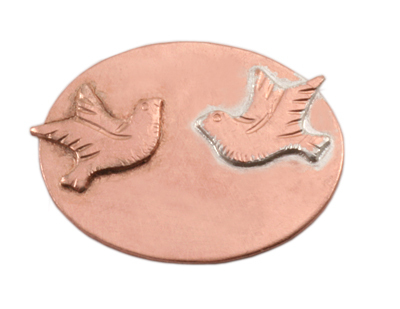 On the piece to the right, Copper Solder was used on the left bird and Silver Solder was used on the right bird. What a difference! AND MORE EXCITING NEWS...our Simple Soldered Pendant class is now FREE! Brush up on your soldering skills and get to work with these fun new products. Yay! Will have to watch the class and then see what supplies I need. 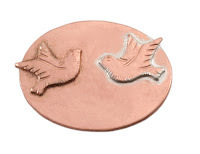 I love the idea of the copper solder, so it doesn't show silver around the piece. I am so so excited to finally see this class being offered and FREE is even better!!! THANK YOU!THANK YOU! THANK YOU!